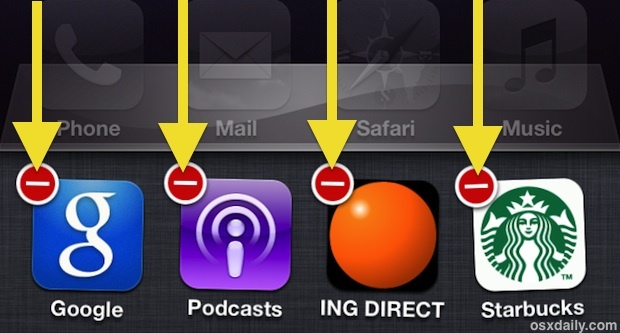 You can quit up to 4 apps at a time on an iPhone and iPod touch, and up to 8 apps at a time on an iPad, that limitation is dependent on how many apps are visible on screen, and from there it’s just a matter of being able to physically tap on all visible red close buttons at the same time. This is obviously just like the standard method of quitting an app in iOS but thanks to multitouch technology it makes closing groups of apps faster than ever. It can be a bit challenging to tap close simultaneously on a group, but give it a few tries and you’ll get the hang of it quickly. To close out all of your apps, flip through the task bar and do 4 finger taps with one hand in the same place, while you use the other to navigate within the multitask bar. There isn’t a way to force quit multiple apps though, if you need to do that you’ll want to just reboot the device, which closes out everything, though after a reboot the most recently used apps will maintain a cache for quicker access than ones that haven’t been launched in a long time. This is for iOS 6 and prior versions, whereas newer versions of iOS like 7.0 and 8.0 onward support a different multitouch trick to quit out of apps from the multitasking panel. You can learn how to quit apps in iOS 7 and iOS 8 here. How can put an icon for folders as a default ? it means when I want to create a new folder , this icon come out! Force quit all apps easily if you’re jailbroken. Install the Switchy tweak for a “Clear Apps” button, plus it also shows 8 active apps at once on an iPhone (two rows of four) and other useful stuff. i think you are correct! i don’t see a point to close these apps. Tried it on the iPhone, 4 finger gesture won’t work on the iPhone or maybe my fingers are too big. I could get maximum 2 apps closing at the same time, not 3, and not 4. Perhaps it makes more sense on the iPad? Wow, what a weak post. Grab a user with a catchy title and feed them garbage. Come on, you can do better. If you don’t have anything usefu to write -don’t. Agreed! What’s next, show us fast way to open iPad by swiping finger along bottom of screen? Did you know that it is freaking difficult if not impossible to hit all the 4 apps at once. This is totally unpractical.